And now for the last region of my most recent Feather’s Pub flight reviews. Yes, I didn’t do any Islays or Campbeltowns. Funny enough, I like both of them quite a bit, however I like to stick to 4-6 drams for one of these, and decided that we shouldn’t hang out in a bar for 12 hours straight. For some reason. Still trying to remember why. Maybe the neighbours would talk? Yeah, let’s go with that. 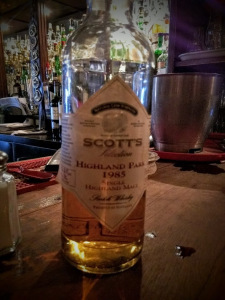 My final dram is Highland Park 1985 Scott’s Selection. This 19 year old dram is, I assume, aged the same way as other Highland Park drams, in bourbon and sherry casks. I don’t 100% know. I know it’s undiluted, so that’s something, And I know all the fancy numbers below.